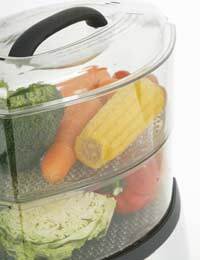 By steaming vegetables you retain the goodness of the vegetables and they are not boiled to a pulp. The flavour is sharper and the colour of the vegetables is retained. There are a few ways to steam vegetables depending on whether you wish to purchase electrical gadgets or see if you like your vegetables steamed before purchase. A simple way to steam vegetables is to place them into a saucepan with a little water in the bottom, bring to the boil, place on the lid and leave on a slow heat for 5-10 minutes depending on the type of vegetables and how much you wish them to be cooked. You have to make sure that the heat is not too high under the pan or the water will boil away and the food will be burnt. Ideally a heavy based iron pan is ideal for this type of steaming. If you are worried about burning the pan and food add an upturned saucer in the bottom of the pan before placing the vegetables in the pan. It is possible to purchase a fan like contraption that can sit in the pan but to be honest a saucer does just as well. If you still wish to steam you vegetables on your cooker then look at the steamer type saucepans that are on the market. They consist of a basic large saucepan and lid with several other pans that sit on top of the original pan. These pans have holes in the bottom for the steam to rise. The lid is then placed on top of the uppermost steamer.It is also possible to obtain bamboo steamers that will sit on a normal saucepan. This type of steamer unit often only seen in Chinese restaurants and are now obtainable in specialist cook shops. A microwave oven is also ideal for steaming vegetables although new potatoes and other thicker root type vegetables should be cooked separate to more tender vegetables. Place all vegetables into a microwave proof bowl. Add a little water, cover with cling film, pierce several times and then cook on high for five to ten minutes depending on the amount of vegetables used. Be careful when removing the cling film as the contents and bowl will be very hot and you could easily receive a steam burn. Plug in electric steamers are now readily available from most electrical retailers. Made of several layers the water is added into the bottom container with vegetables placed in separate compartments and a lid placed on top. An electrical timer is set and the vegetables can be left to steam to perfection before being turned off. When making layers of vegetables to be steamed place new potatoes and other thicker root vegetables at the bottom of the steamer where there is more heat. Electric steamers will give you a chart to set the time for different vegetables. If you wish to steam a variety of vegetables that include some softer items such as peas or frozen vegetables then add them to the top stem compartment in the final minutes of steaming. By placing a sharp knife through a potato you can tell when it is ready to eat. Peel slice and wash vegetables in the same way that you would when cooking them any other way. Steamed vegetables should take no longer than ten to fifteen minutes so calculate at what time you should start the steaming process depending on whatever food you are preparing for your dinner.